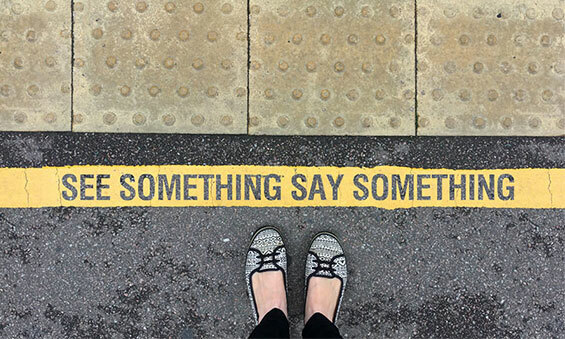 If you see or hear suspicious behavior on the transit system — we ask that you report the activity to transit staff. If you do not see a uniformed representative – please call (760) 966-6700 and report your observations. If you observe violent behavior or other criminal or threatening acts that could endanger life and property – please dial 911 immediately! Please call 911 in case of transit emergencies and to report suspicious behaviors around the transit system. “See Something, Say Something”™ is an innovative nationwide campaign developed by the U.S. Department of Homeland Security to raise the awareness of safety threats such as criminal behavior and terrorist activities and to encourage the public to tell local law enforcement officials about any suspicious activity they may have seen. NCTD contracts with the San Diego Sheriff’s Office and local law enforcement agencies to patrol and provide law enforcement and security services at our transit centers. Sheriff’s Deputies and Police Officers will issue citations for adult passengers who are not in possession of valid fare or proof of reduced-fare eligibility on NCTD SPRINTER train platforms (which are designated as “fare-paid zones”) and NCTD transit vehicles. Additionally, failure to have a valid fare on NCTD modes of transportation may result in a citation/fine pursuant to NCTD Ordinance 3 and Public Utilities Code §125450. As another layer of security, NCTD utilizes state of the art Closed Circuit Security Television (CCTV) technology. Continual 24-hour monitoring is maintained utilizing hundreds of high definition security cameras that are located at NCTD transit centers and on-board transit vehicles. NCTD also monitors social media for any transit related posts that could impact service or safety and posts service updates through Twitter @GoNCTD. NCTD works in cooperation with Operation Lifesaver to highlight the need for safe practices around railroad tracks. Be alert – it’s difficult to judge train distance and speed. Look both ways – trains may come from either direction at any time. Don’t use cell phones. Do remove ear buds. Don’t take shortcuts across the tracks. Don’t lean over railings. Trains can overhang tracks by 3′ on each side. Don’t cross between, under, or walk around a parked train. It may move without warning. Always use crosswalks and obey all traffic signs, signals, and crossing gates. Trains on the coastal rail line travel up to 90 mph. Trains are fast, quiet, and take a long time to stop. Warning strips are located at the edge of station platforms. Stay behind at all times. Be careful of the gap between the platform and the train and take particular care to step well clear of the gap as you board the train. Walk – do not run – on a train platform to avoid tripping and potentially falling onto the tracks. Never ride skateboards, scooters, or bikes on a train platform and always turn wheels so they are at right angles to the tracks. 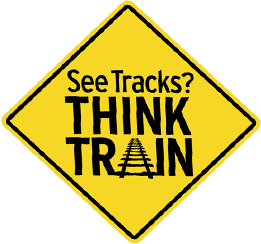 Join us in spreading rail safety education awareness and help keep your community safe. Schedule a presentation today for your school, business, or community group by contacting media@nctd.org. In addition to preparing employees for transit emergencies, NCTD coordinates with local law enforcement and fire departments to ensure a prompt, effective response. Stay informed: Know what’s going on with your commute, follow NCTD on Twitter, Facebook and Instagram. STAY OFF. STAY AWAY. STAY ALIVE. NCTD works with local emergency agencies to hold large scale exercises to provide a safe environment for firefighters and law enforcement to practice responding to a variety of emergency scenarios that might happen on our trains or buses. For more information, please visit the Operation Lifesaver website or the California Operation Lifesaver website.